The Pennsylvania Propane Gas Association is asking people who heat with propane to take some simple steps to keep their families safe and warm this winter. 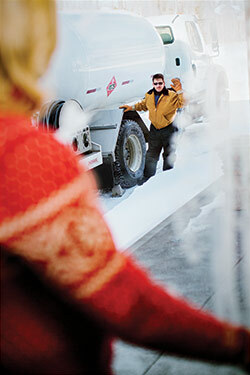 Propane delivery trucks are very wide, so please clear your driveway to a width of 12 feet to allow for access. Also, don’t forget to clear a path to your tank so the delivery person can get to it. Harrisburg, PA – Stephanie Berkheiser of Manheim, PA is the winner of the 2015 PAPGA Football Sweepstakes Grand Prize Package. Ms. Berkheiser wins four tickets to the Penn State vs. Michigan College Football game in State College, PA on November 21st, 2015. The grand prize also includes accommodations, pre-game hospitality and a visit to the actual playing field. The winner’s name was randomly selected from over 500 entries on November 10th. The sweepstakes began on September 1st and ended at midnight on November 9th. This is the fourth year of the PAPGA Football Sweepstakes. Coming up this spring, PAPGA will host its first Sports Weekend Experience (featuring a Penn State Basketball game) with an additional online sweepstakes. Details will be announced soon. Harrisburg, PA – High winds, power outages and other severe weather effects can not only put a strain on your home energy system, but can also cause significant safety concerns for your family. PAPGA and The Propane Education & Research Council (PERC) invite you to review important safety information at this link. Check for downed power lines in and around your property; they can create major safety hazards. Floods can move, shift, or damage gas lines and tanks. Immediately call your local utility company or propane retailer if any of these hazards exist. Make sure the area within 10 feet of your propane tank and your propane grill is clear of flammable materials, especially if the forecast calls for extreme heat. Remove any debris that is combustible or easily ignited, including leaves, brush, any vegetation, and rags. The Weather Events Page also includes general guidelines and basic preventative tips for you to review as part of your emergency preparedness plan. For the complete list of the Consumer Safety Modules, hit www.PApropane.com and click on the Safety Modules Link in the middle of the main page. If you need a Certified Technician to conduct a safety inspection of your energy system and appliances, click or tap this link to find the nearest provider. Harrisburg, PA – A long-time member of the Pennsylvania Propane Gas Association and Pennsylvania Propane Foundation Board of Directors was recognized for his outstanding service at the Association’s Spring Membership Meeting on April 4th in Grantville, PA.
Phil Smith, of Gas Works Inc., was presented a Special Award to recognize his 32 years of service to the Pennsylvania Propane Gas Association, serving as their Treasurer on the Board of Directors. “I’ve learned a lot from the other members and have enjoyed my years on the Board,” said Mr. Smith after receiving the award. Mr. Smith was presented the award in front of over 100 members and industry representatives at the PAPGA 2014 Spring Membership Meeting. “I wanted to take the time to publicly thank Phil and present him with a personalized wooden bobtail. Phil Smith is an inspiration with his dedication, commitment and enthusiasm he shows as Treasurer and a member of the Board of Directors,” stated Mark Delehanty, PAPGA President and owner of Independence Propane. Pennsylvania has had a Price Gouging Law in effect since 2006. It triggers with the Governor’s declaration of a state of emergency and remains in effect for thirty days after the emergency ends. This is the same declaration that gives you “Hours of Service” relief. The law is complicated and prohibits “unconscionably excessive” pricing. Any price increase 20% or more above the pre-emergency prices may trigger that law. Defenses available to the law based on federal or state controlled tariffs or rates on regulated pipelines, railroad transport, shipping, replacement costs, credit card costs or taxes, and certain supply chain increases. Be careful implementing special charges during any protected period, which were not used or charged prior to the protected period. For more detail about the law, contact Kathy at ksm@skarlatoszonarich.com.